Alice Eve Cohen is an award-winning playwright, solo theater artist, and memoirist. The recipient of numerous fellowships and grants, she teaches at The New School and lives in New York City. I adored this book! Once I started reading What I Thought I Knew, I couldn't put it down. 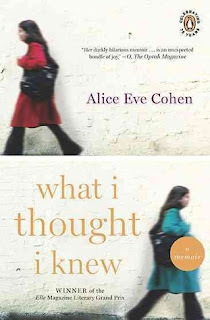 This is one memoir that will stick with you and you will want to read about the next chapter of Alice Eve Cohen's life. I have just found out that she is working on another memoir so I can find out what happened next. Normally, memoirs are just one story, but this one left me wanting a bit more. I become so wrapped up in the author's life that I can't wait to find out how everything turned out. The book takes you through all of the heart breaking decisions that Cohen had to make with her health and that of her unborn child. It put a face on the major problem that the lack of healthcare can have on a person. Even when that person has access to doctors and minimal health insurance, it is difficult to obtain quality care. Cohen finds herself with serious of bewildering symptoms. She is told that she is in early menopause and told she can't possibly get pregnant. A series of blunders by multiple doctors leads to serious complications when that turns out to be untrue. This is also a cautionary tale of how people shouldn't believe whatever their doctors' tell them at face value and that they need to take an active part in their health. Even when Cohen tried to do this, she was shot down for trying to be proactive in asking for a pregnancy test. I mean, did you know that those tests are only accurate during the first three months after conception? She is really lucky that everything turned out somewhat in her favor and that her daughter was born with issues that could be helped. I really think that Cohen did every woman a favor by writing this book. Contest is open to anyone with a US mailing address. This giveaway is sponsored by the Alice Eve Cohen and Me! and one book will be available. Sounds like an interesting story. Thanks for the info! Oh, I love these pregnancy books...don't make me miss being pregnant though, bt love to read them!! Love the cover for this one too!! Visited her site and learned that her book has been optioned for a movie on Lifetime. I went to the Alice Eve Cohen's website and learned that "What I Thought I Knew" book was Oprah Magazine’s 25 Best Books of Summer. Pretty cool!